Unfortunately, as we age our skin typically tells the truth about how old we are. Granted, there are some people with amazing genetics (or surgeons) that tend to look five, ten or even twenty years younger than they actually are. Most people do not fall into this category. The majority of us live lives that have put us in the sun for prolonged periods over the years, have blemished skin with acne scars, or just simply have wrinkles, brow lines and smile lines that have shown up. At Medical Aesthetics at Guilford, we have a variety of techniques that can help alleviate, and may even make some of these issues disappear. One specific form of treatment, called Laser Genesis™, is a form of preventative and corrective therapy used to treat skin that has suffered from rosacea, uneven skin tone, acne scars and enlarged pores. Laser Genesis™ is a process that kick-starts collagen production that helps diminish fine lines and wrinkles. All of these treatments may be used on the face, chest or neck and typically last around 30 minutes. Don’t fear, many patients have described the feeling as pleasant and relaxing. 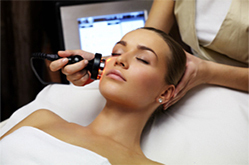 The laser creates a warm, tingling sensation as it makes its way across your skin. Side effects may include redness at the treatment location, skin sensitivity, and in some cases, possible peeling. The laser starts working be penetrating deep into the skin, correcting problem areas at the cellular level. Collagen production is increased and helps to break down capillaries and releases trapped blood that has been under the surface and turned the skin red, all by way of temporary thermal treatment. The process also allows the shrinking of enlarged pores, thus limiting the bacteria, dirt, horn and tallow normally able to become lodged inside them. Though results may not look extraordinary at first, patients will typically see results anywhere from 3 to 9 weeks after their initial treatment. You may or may not be aware that skin cycles about every 28 days. This is the what keeps the deep cells within the skin so long to show repair. It does take a little bit of time for them to be visible on the surface. However, once this process begins, you’ll start to notice vast improvements in your skin’s redness, texture, scarring, and fine lines. The majority of our patients need about 4 to 6 weeks to see optimum results based on their skin type. It is recommended that treatments have a frequency of every 2 weeks over a 12-week span. Keep in mind that the number of treatments will depend on how severe the redness, scarring, and all around unevenness found in your skin. Like any treatment or surgical procedure, there are tips that help promote proper healing of said treatment. Things like drinking plenty water, using sunscreen when you’re going to be in harsh sunlight, and keeping the treated area clean. After the treatment, Medical Aesthetics technicians will perform a gentle cleanse and tone, but further cleaning is required. After a brief time, your skin will feel fantastic and look aesthetically pleasing.